If there’s one food I can’t live without, it’s plantains. Green, ripe, sweet or starchy, boiled, fried, mashed, I’ll take ’em. They’re so versatile, and are definitely more satisfying than a plain old potato. If you’re looking for ways to switch up those boring carbs on your plate, plantains are the way to go! My favorite thing to do with plantains is making fried plantain cups! Bread bowls, move aside! These tostones rellenos (stuffed twice fried plantain cups) are an awesome hand-held appetizer or dinner option that will truly impress your guests. 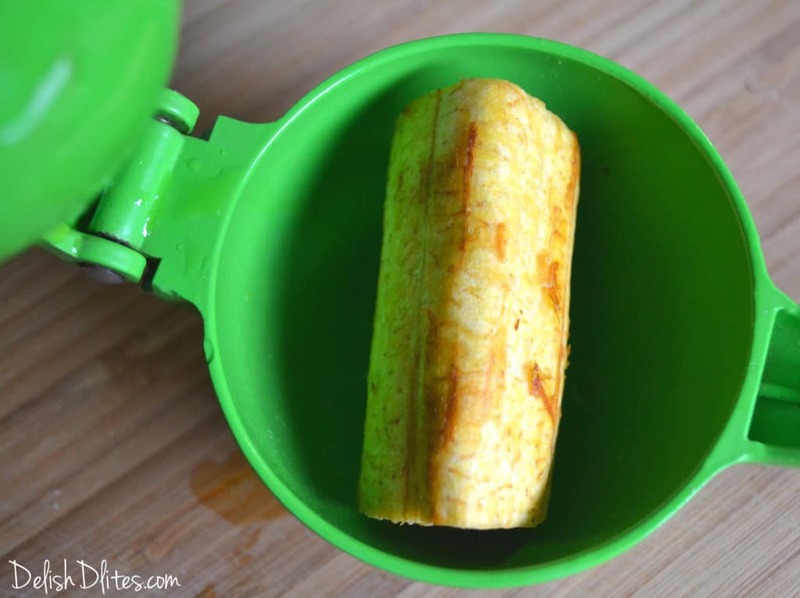 So how do we make these delish plantain cups? So glad you asked! Some people will tell you you need a fancy tostonera (fried plantain squashing device). I’m not a fan of them, because I think they make unevenly shaped cups, and for someone as Type A as I am, that’s just unacceptable. 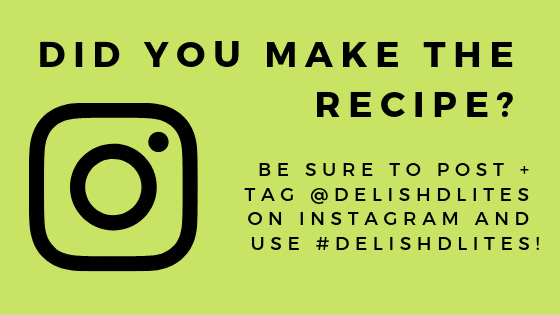 So what do I use to make these delish cups? A good, old fashioned lemon squeezer! That’s right! This handy, dandy lemon squeezer makes the perfect plantain cup! Isn’t that the greatest?! For the shrimp and avocado salad, combine all the ingredients except the green plantains and canola oil. Refrigerate while you make the plantain cups. Here’s a green plantain. As long as your plantain is green, it’s good to use for this recipe. If it’s yellow, then the texture will be too mushy and it won’t hold up properly when making the cups. 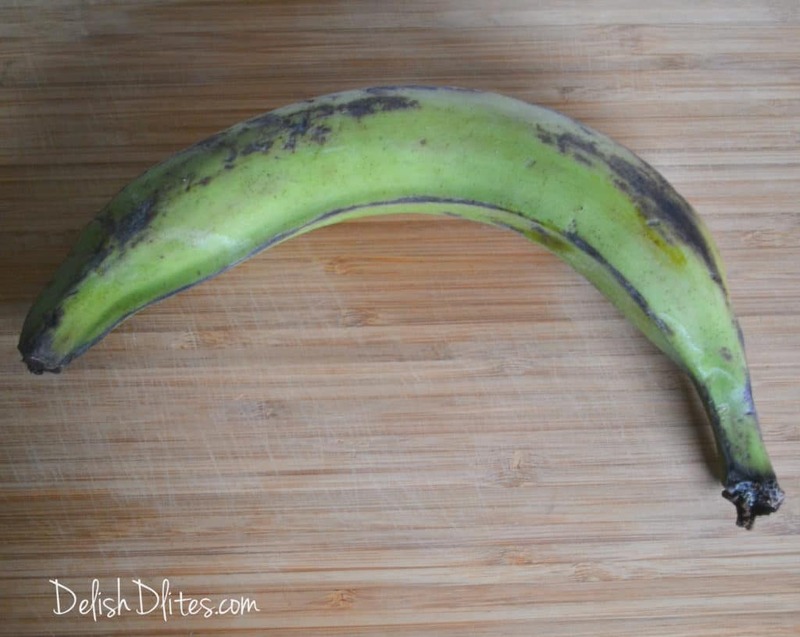 To peel the plantain, cut the ends off. 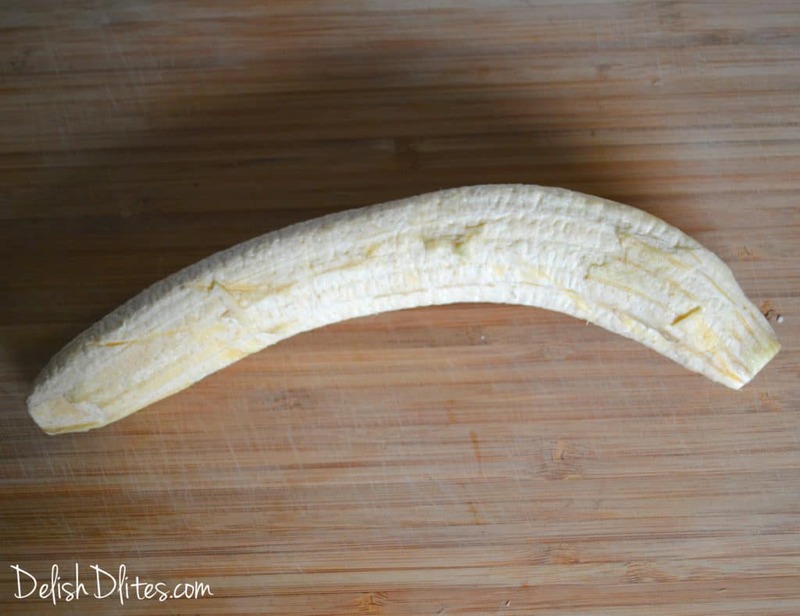 Then make a cut all the way down the length of the plantain. 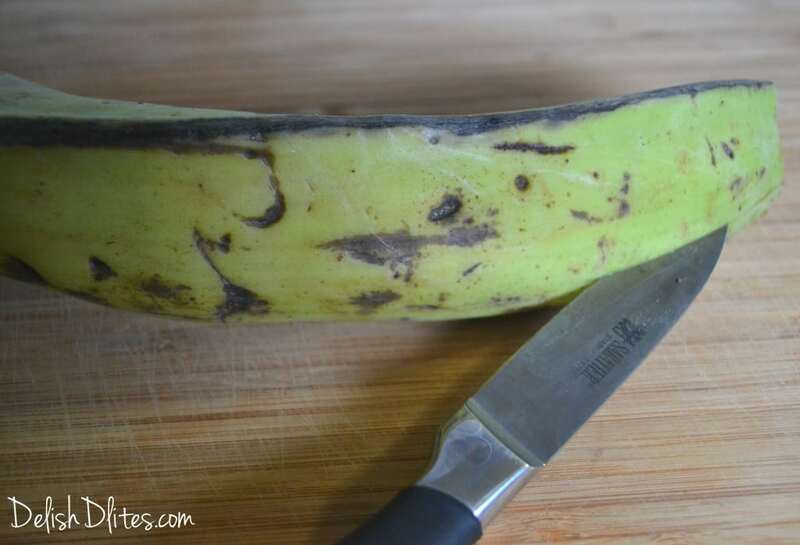 Use the edge of your knife to pry the skin away from the plantain flesh inside. 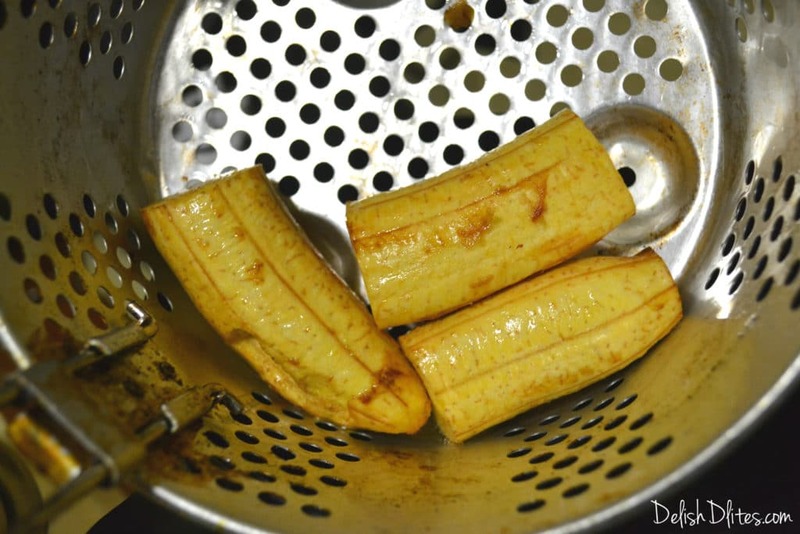 Continue this process until you have a peeled plantain. 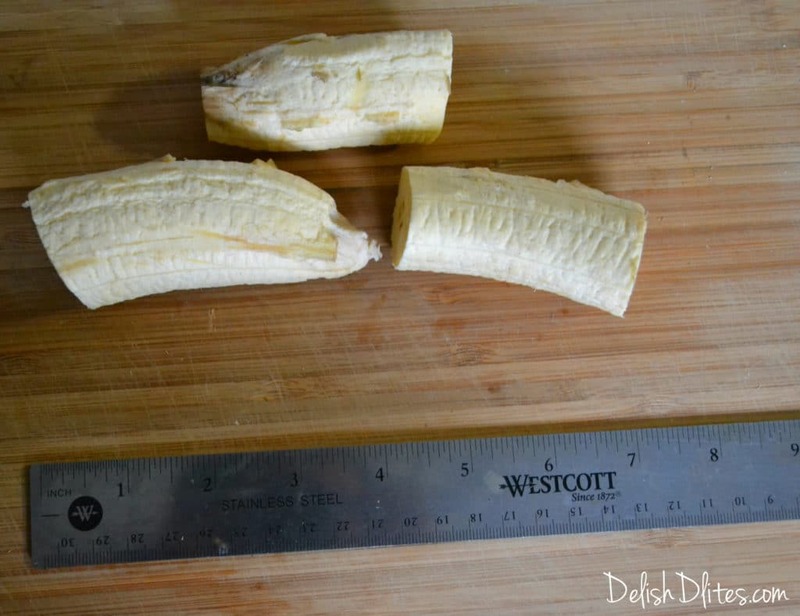 Now, cut the plantain into 3″ pieces. If the piece fits snugly into the lemon squeezer, then it’s the perfect size. If your squeezer is smaller, cut the plantain into smaller pieces. Fry the plantain pieces at 350 degrees F until they’re golden brown (about 5-6 minutes). 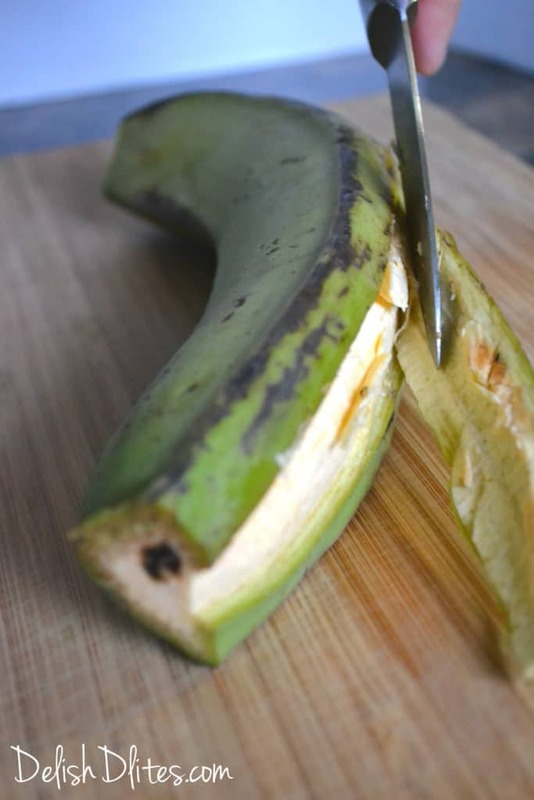 If you can slide a knife easily into the plantain, then it’s cooked. Make sure not to undercook them, or they will fall apart when you press them into the cup shape. Rub some oil inside the lemon squeezer to prevent the cup from sticking. 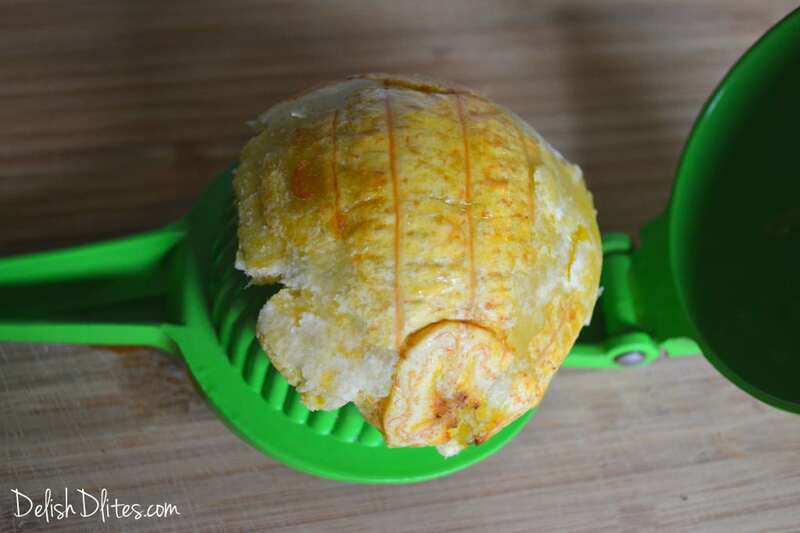 Place the fried plantain piece into the lemon squeezer. Press down all the way to form a cup. Gently pry the cup out of the lemon squeezer. There it is, a beautiful little plantain cup! Raise the heat up to 375 degrees, and fry the cups for 3-4 minutes, until they’re a deep golden brown, and crispy. Sprinkle them with a touch of salt while they’re hot. Then fill them with the shrimp and avocado salsa, and serve immediately. 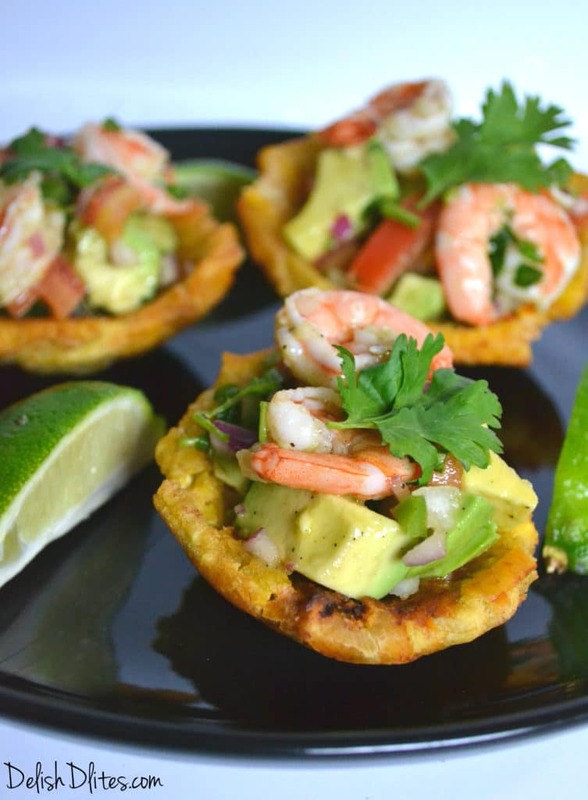 A delicious appetizer featuring fried plantain cups filled with a vibrant shrimp and avocado salad. To peel the plantain, cut the ends off. 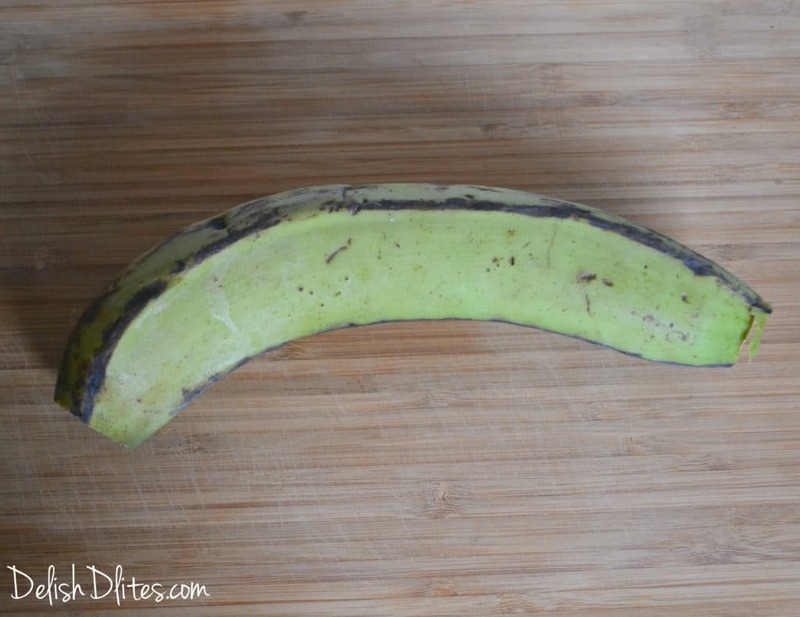 Then make a cut all the way down the length of the plantain. Cut the peeled lantain into 3" pieces. If the piece fits snugly into the lemon squeezer, then it's the perfect size. If your squeezer is smaller, cut the plantain into smaller pieces. Fry the plantain pieces at 350 degrees F until they're golden brown (about 5-6 minutes). If you can slide a knife easily into the plantain, then it's cooked. Make sure not to undercook them, or they will fall apart when you press them into the cup shape. Drain the plantain chunks. Rub some oil inside the lemon squeezer to prevent the cup from sticking. 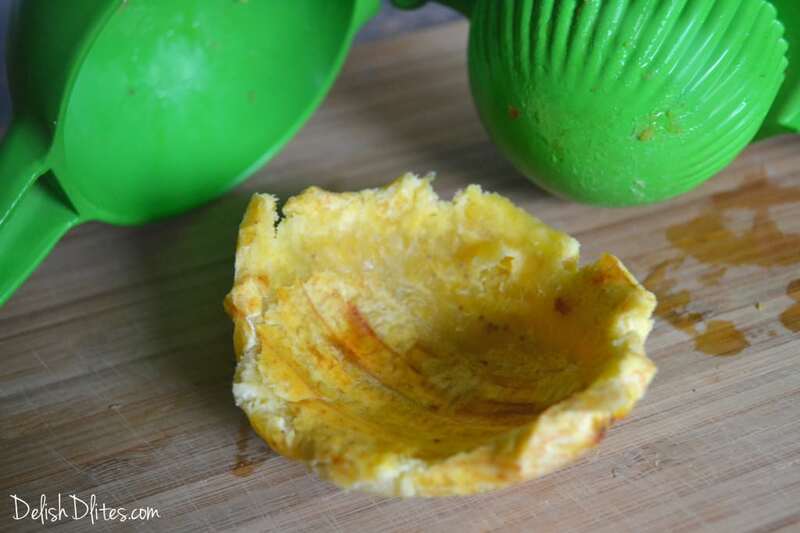 Place the fried plantain piece into the lemon squeezer. Press down all the way to form a cup. Gently pry the cup out of the lemon squeezer. 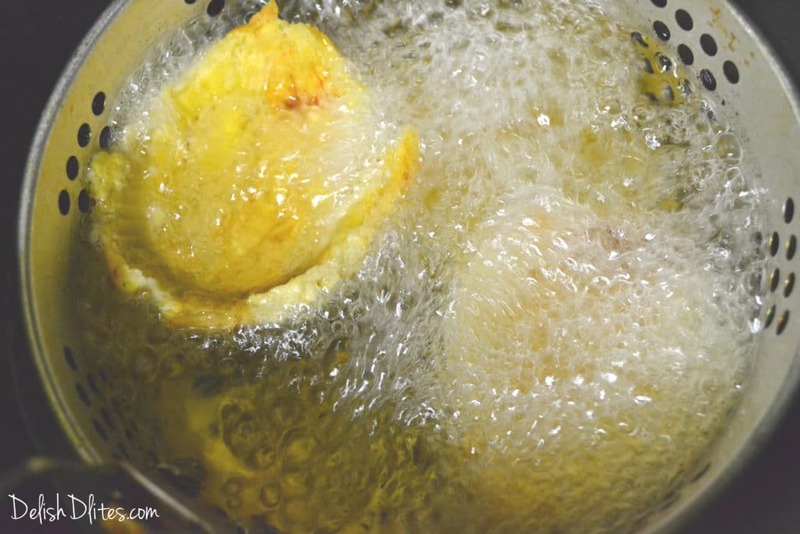 Raise the heat up to 375 degrees, and fry the cups for 3-4 minutes, until they're a deep golden brown, and crispy. Drain and season with a pinch of salt. 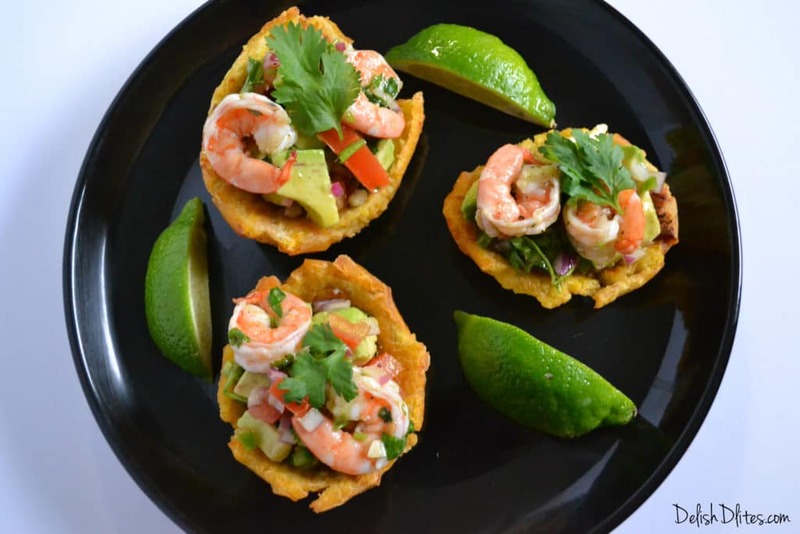 Fill the fried plantain cups with the shrimp and avocado salad, and serve immediately. Thanks for such detailed explanation with pictures. Really makes it easy to follow. And lemon squeezer is a great idea! Glad you enjoyed the post Rachana! I’m having some company over and already teased this dish with a few people. Now I’m stuck cause I don’t know what else to make to compliment the plantain cups. Any suggestions? Hi Carlos, I would make some rice and beans to round out the meal. Gracias por los tips! I learned more in a few minutes reading this page about making the cups and plantain management that I have in years! Gracias otra vez! Felicidades! De nada Bill! Burn provecho! Hi Maria, unfortunately tostones are one of these foods that needs to be eaten fresh. One thing you could do is do the first fry, form the cups, then freeze them. 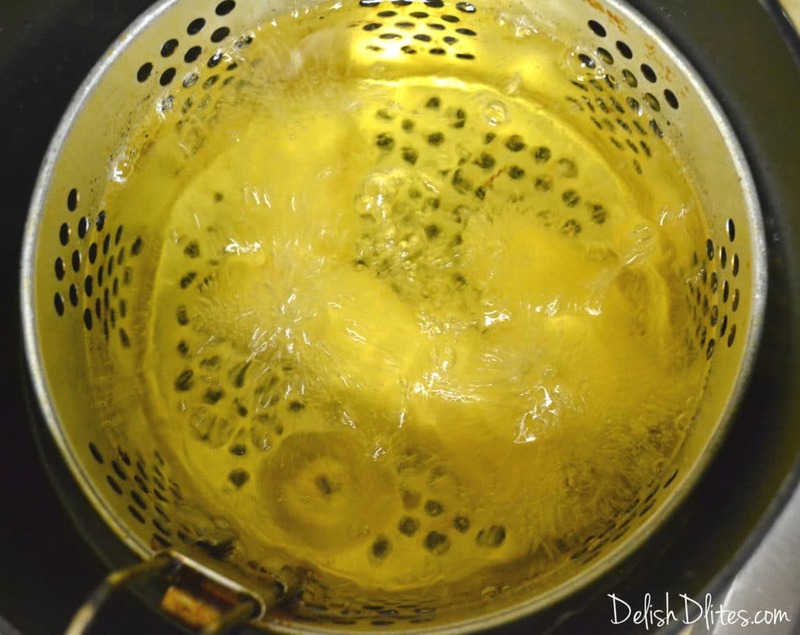 Do the second fry right before you want to serve them. You don’t have to thaw them before frying. 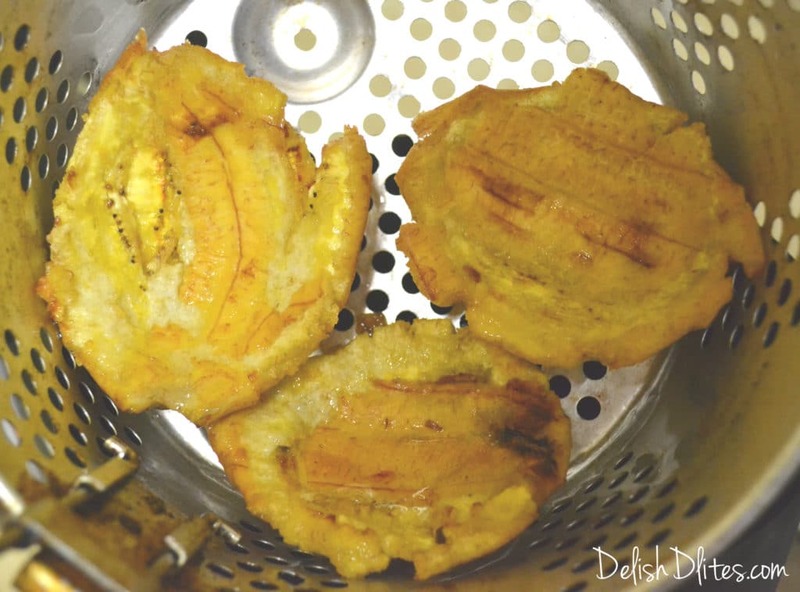 Hello Jannese, I have never cooked with plantains before,but was wondering if you knew if this could be prepared a little more on the healthy side, without frying the plantains. Is it possible to boil them first, shape them, then coat them with a little canola oil and bake them? Any help would be appreciated! Hi John! You can definitely bake the plantain chunks and then smash them. Brush them with oil and bake at 375 until they’re fork tender. Follow the same smashing method; then brush again with oil and bake until crisp. Let me know how they turn out! 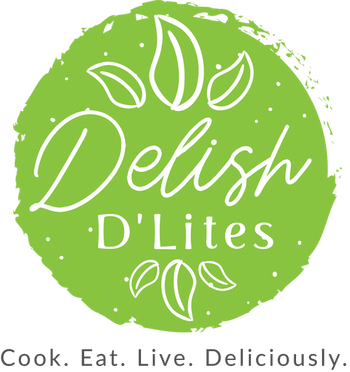 I just did an adaptation to this: boiled them in the skins (makes the skins very easy to remove) mashed them with coconut oil, then took a ball of the mash and pressed it into a greased cupcake tin, baked it on 400F for 35 minutes or until firm enough to hold together and crisp on the edges. Turned out quite nice!